4 Bedroom Semi Detached House For Sale in Macclesfield for Guide Price £525,000. Situated on the outskirts of Prestbury, affording breathtaking countryside views over the Adlington Estate, Oak Lea is a larger than expected three bedroom, two bathroom period home with its own separate one bedroom annexe or office suite. The accommodation is beautifully presented and briefly comprises; entrance porch, entrance hall, living room with period style fireplace which is open to the dining room, again with feature fireplace and offering French doors opening to the rear garden. An inner hall leads to the downstairs cloakroom / wc and into the generously proportioned dining kitchen. 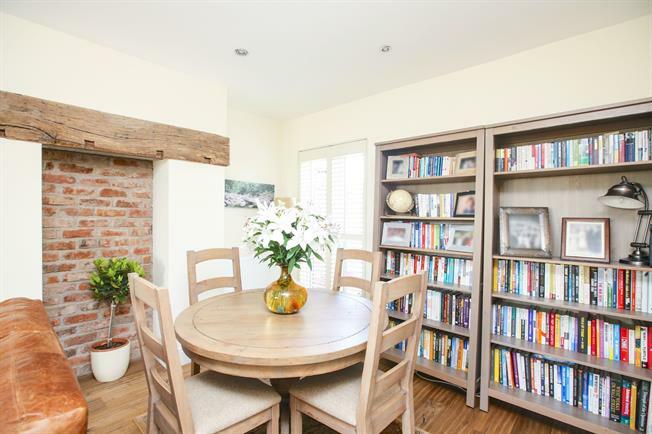 The kitchen opens out into the family room creating an ideal living space opening out to the low maintenance garden and looking over the fields beyond. The first floor hosts three bedrooms, the master having an ensuite shower room and Juliette balcony taking full advantage of the outlook. There is also a modern family bathroom to this floor. In addition is a separate annexe, constructed in a rather charming cottage style. This building contains a studio bedroom or office, shower room, utility and boiler / store room. An ideal space for working from home or for those who have regular overnight guests. Externally the property is set well back from the road behind gates which lead to the driveway offering off road parking for several cars. To the rear is a low maintenance garden offering an ideal space for enjoying the view over the adjacent fields.